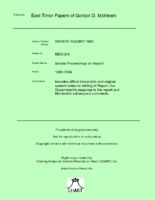 Placeholder for McIntosh key documents / exhibits. Published by Sydney's Campaign for an Independent East Timor (Denis Freney). Clips from British, Portuguese media. 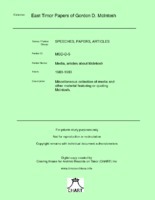 Copies of articles, Editorials from significant US Newspapers. 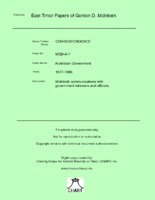 Declaration of independence of Acheh, Sumatra - issued 4 December 1976. 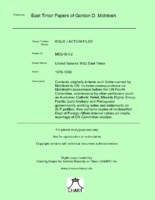 Miscellaneous media items, letters from European government and non-government sources. 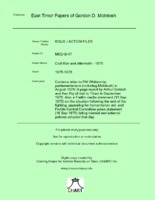 Includes the Dutch Komitee Indonesie 1985 listing of ET political prisoners held in Java. Material from Tapol, Catholic Institute for International Relations, Lord Avebury, Parliamentary Human Rights Group. Official UN documents including 1984-5 UN Sec-Gen progress reports on Question of East Timor; also letter to John Birch. 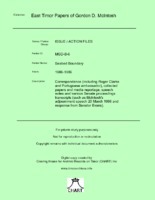 Includes miscellaneous collection of media material based on interviews with then ET Governor Mario Carrascalao. 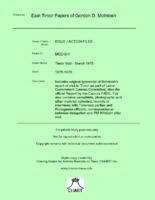 Various documents (many in Portuguese) describing particular events or situations inside Timor. Includes text of letters from Monsignor Belo and former Apostolic Administrator Lopes. Includes items from Jim Dunn, Rob Wesley-Smith and Herb Feith. 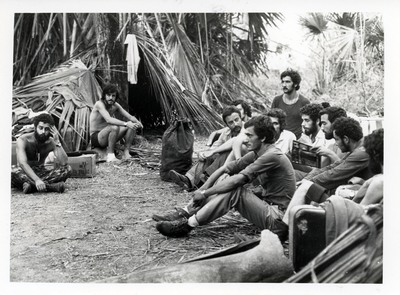 Miscellaneous collection of materials from East Timor Activist organisations such as AETA, ACET, CIET, CISET, Friends of East Timor, etc. Miscellaneous collection of letters, media releases, statements from governement Ministers and Departments. Submissions and additional material from variety of organisations and individuals, including Catholic Commission for Justice and Peace as well as Foreign Affairs and Immigration Departments. Supplements original written and verbal testimony. 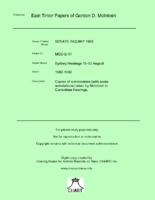 Copies of submissions by West Australians - given directly to McIntosh for lodgement with Committee Secretariat. Folder includes list of submissions. Includes official transcripts and original speech notes on tabling of Report, the Government's response to the report and McIntosh's subsequent comments. In 4 folders.Transcripts of non-public evidence given "in camera" to the Committee. In 3 folders. Five successive drafts of the final Committee report. From April 1983 (annotated) to September 1983. 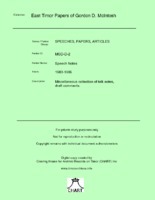 Original text of speeches in a range of forums. Photocopy of all McIntosh's contributions to proceedings in the Senate chamber (i.e. 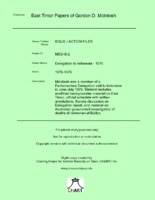 includes non-Timor material). One folder containing multiple folders of unsorted Hansard items. Includes Senate motion texts; letters lobbying for inquiry. Includes McIntosh discussion paper on Labor government and ALP policy, with 'Answering the Apologists: Responses to common myths..' on annexation of East Timor; media clippings. Includes correspondence, draft proposals, State and National foreign policy resolutions. Includes contact address lists, internal office organisation materials. Background on controversy over authenticity of Monsignor Belo letter highly critical of human rights situation. Mainly specific case files; some broader notes and correspondence on policy issues. Correspondence (including Roger Clarke and Portuguese ambassador), collected papers and media reportage, speech notes and various Senate proceedings transcripts (such as McIntosh's adjournment speech 20 March 1986 and response from Senator Evans). 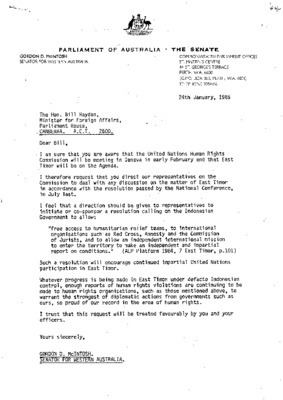 McIntosh petitioned the UN Decolonisation Committee in November 1982. 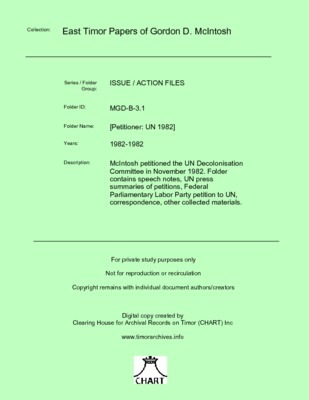 Folder contains speech notes, UN press summaries of petitions, Federal Parliamentary Labor Party petition to UN, correspondence, other collected materials. 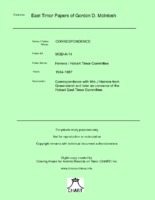 Correspondence with Mrs J Herrera from Queensland and later as convenor of the Hobart East Timor Committee. Communications with Lord Avebury, House of Lords, U.K. and Carmel Budiarjo, Tapol, UK. Correspondence with Australian and international Timor activist organisations and individuals. Correspondence with New Zealand parliamentarians. Correspondents include Prime Minister Cavaco Silva, Foreign Minister Jaime Gama and Portugal's Ambassador to Australia. Also contains report of the Non-Permanent Commission for the Following Up of the Situation in East Timor (Nov. 1986; 41 pages). 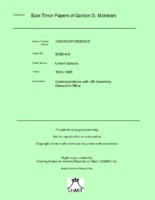 Correspondence with UN Secretary-General's Office. Correspondence with East Timorese political leaders, community leaders and members. Includes letters supporting McIntosh's decision to dissent from the official report of the delegation, and McIntosh's letter to the Prime Minister about his dissenting report. 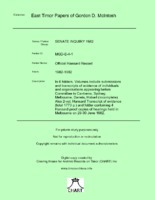 McIntosh correspondence with individuals concerning but outside the official proceedings of the 1982 Senate Inquiry into East Timor. 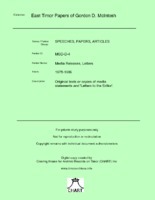 McIntosh communications with government ministers and officials. Includes internal McIntosh office notes on contentious elements of final report. 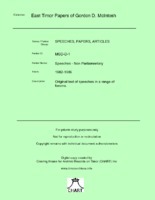 Proof copy of Hansard record of tabling speeches in the Senate and House of Representatives (Morrison, Dobie - incomplete). 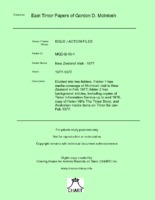 Three copies with annotations by McIntosh's research staff (Steve Wakeham and John Waddingham). Research notes and drafts for McIntosh's dissenting report. Also includes some records on McIntosh's complaint of unethical behaviour of Delegation leader Bill Morrison, incorporating criticism of dissenting report in the Delegation's formal report.